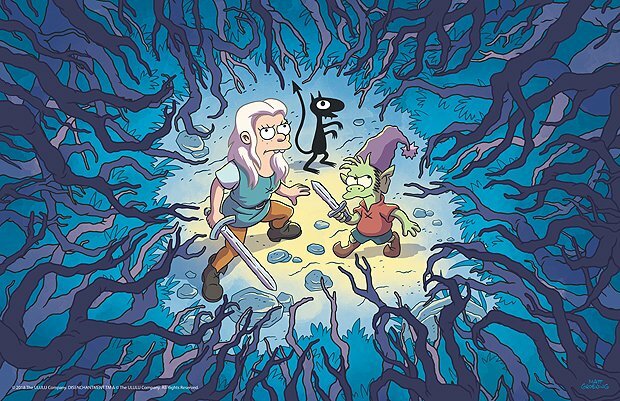 The big news has to be Matt Groening's brand new cartoon Disenchantment (17 Aug). After tackling the American family (The Simpsons) and sci-fi (Futurama) Groening turns his (all-seeing) eye on the world of swords, sorcery, fantasy and fairytales following the misadventures of alcoholic Princess Bean (voiced by Broad City's Abbi Jacobson) and her elf and demon companions. Meanwhile, Insatiable (10 Aug) has been making news for all the wrong reasons with accusations of fat shaming as a high school girl Patty (Debby Ryan) suddenly becomes popular after losing weight over the holidays and seeks revenge on her former bullies. There's even a petition calling for Netflix to cancel the series. Horror production powerhouse Blumhouse are behind three part Indian miniseries Ghoul (24 Aug) which is a unique take on themes of terrorism and interrogation with a supernatural twist. There's also the return of crime drama Ozark (31 Aug) and Breaking Bad spin off Better Call Saul (weekly episodes from 7 Aug). In movies Netflix Original Like Father (3 Aug) pairs Kelsey Grammer and Kristen Bell as a a father and daughter who end up on a honeymoon cruise together. Other new comedies available include Bad Moms (26 Aug), Bridget Jones's Baby (30 Aug), Hot Fuzz (4 Aug) and classic A Fish Called Wanda (1 Aug). Action fans should enjoy Matt Damon in the fifth Jason Bourne (1 Aug), Mark Wahlberg in real life war drama Lone Survivor (9 Aug) or a triple bill of Hong Kong thrillers with the Infernal Affairs trilogy (1 Aug). Kids films include The Secret Life of Pets and the gorgeous Kubo and the Two Strings (16 Aug) and for anyone who loves so bad they're (almost) good movies, check out 80s Marvel misfire Howard the Duck (4 Aug).